“Jasmine,” “kiwi,” “green apple,” and “banana” were just some of the flavors used to describe winning coffees at the first Taza Dorada Robusta (Robusta Golden Cup) national coffee competition that concluded this past week in Lago Agrio, Ecuador. 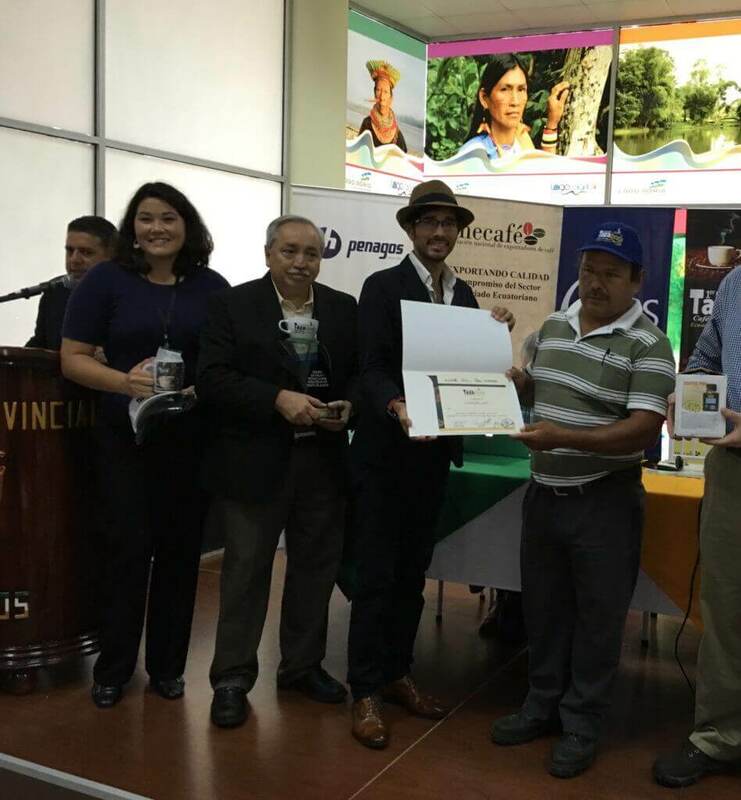 The event was organized by Anecafé, Ecuador’s national coffee association, with Catholic Relief Services and the Sucumbíos provincial government. All twenty-five semifinalist coffees sold immediately following the event at substantial price premiums, with the top green coffee lot fetching US$2.25 per pound, or approximately three times local rates for commodity Robusta. The #1 lot sold to Miguel Meza from Paradise Coffee Roasters of Minneapolis, Minnesota. Meza participated as an international judge at the event. Thirty-eight lot samples were collected for the competition from a diverse cross section of smallholder farmers and coffee estates in Sucumbíos, Orellana, Guayas and Napo provinces. In early July, the coffees were evaluated using Coffee Quality Institute (CQI) Fine Robusta protocols by a national panel of trained Q Robusta Graders in Manta, coastal western Ecuador. Twenty-five lots advanced to a semifinal round in Lago Agrio, on the edge of the Ecuadorian Amazon Rainforest, officiated by a panel of five national and international cupping judges. All but three semifinal samples were evaluated at a numerical quality score 80 points or higher on the 100-point Fine Robusta scale. The average point score of all semifinal coffees was 81.99, with the top ten averaging 83.17. The top five coffees all originated from Sucumbíos Province. All coffees in the semifinal round were processed using the washed method of coffee processing. The week of semifinal competition culminated in a two-day educational program with presentations and panels by Ecuadorian and international participants on the topics of differentiated Robusta coffee marketing, climate change, quality improvement and sustainability. Approximately 300 farmers from the surrounding region and others attended to participate in the sessions. When the results were announced, farmer Mr. Calixto German Rivera Narvaez took the top spot at 84.40 points with his coffee, described as “grape candy, kiwi, stewed fruit and residual banana,” by the judges. Sr. Rivera’s small estate coffee is grown at 800m above sea level, the highest elevation of the samples received. Second (Abel Lapo Tandazo) and third (Jesús Torres) position were close behind at 84.15 and 84.10 points respectively. Coffees placing in the number two and three positions were purchased by Ecuadorian coffee company El Café C.A. at the premium prices of $1.40 and $1.30 per pound, which is between 50-60% more than market rates. Lots #4-15 purchased by Solubles Instantáneous C.A., fetched $1.05 to $1.15. Lots #16-25 were also purchased by El Café C.A. at $1.00 per pound.